Step into a world that uses the language of mathematics, logic and science to explore the Black British experience, masculinity and mental health. These themes are pushed through the lens of Keisha’s relationship with her dad. A recluse who has mainly communicated with Keisha through letters, symbols and books. Keisha Thompson is a Manchester based writer, performance artist and producer. She is currently touring award-winning solo show, Man on the Moon. 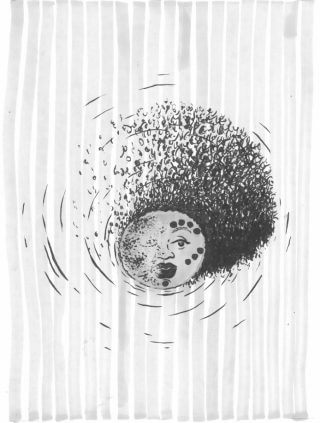 Her debut book, Lunar, features her poetry in addition to the show script. She is also the Young People’s Producer at Contact, chair of radical arts funding body, Future Ventures’ Fund, is a member of Greater Manchester Cultural and Heritage Group and is on the Leaders of Tomorrow scheme led by ITC and RTYDS. She has supported artists such as Kate Tempest, Hollie McNish, The Last Poets, Saul Williams, Amiri Baraka and has performed in Brave New Voices festivals 2008 & 2009.